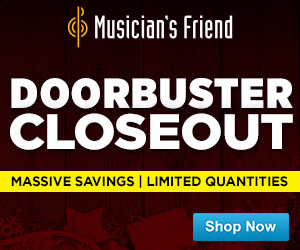 Home Musician’s Friend Accessory Sale! Looks like Musician’s Friend is having a pretty great accessory sale. Nearly 3000 accessories are discounted this week with a savings up to 81% off! Accessories include strings, sticks, picks, straps, cables, stands, cases, etc. This is a good time to gear up on some of the nuts-and-bolts stuff. I know accessories aren’t always fun, but having good cables and to stock up picks.. is always a good thing. The sale is good from February 8th to the 15th. Click the banner below to get in on the action!